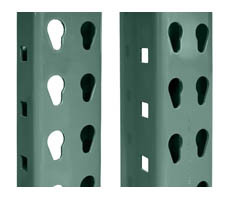 Choose from a wide variety of sizes with SJF Teardrop style heavy duty pallet rack uprights. These upright frames utilize universal teardrop style connectors which can be interchanged with any and all standard teardrop racking on the market today. All uprights come painted with high visibility paint reducing damage to racks and accidents to employees. Now in sizes to fit almost any storage need. *All capacities based on 48" shelf spacing. SJF can provide you with layout, design, engineering and installation services for your rack. Call for details. Post size is 3" x 1-5/8". Painted using high quality, high visibility polyurethane paint that is environmentally safe. Maximum craftsmanship - Tolerance within 7/1000 inch. SJF also has a large inventory of used pallet racks, drive-in racks, and push-back racks - in stock & ready for immediate shipment! 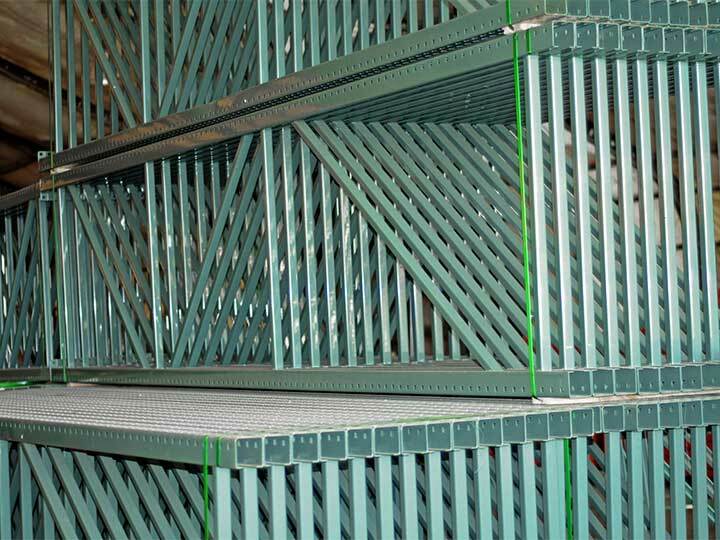 Uprights form the ends and connecting pieces between bays of pallet racking. 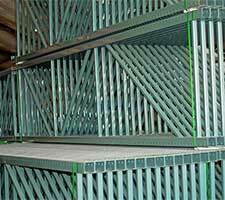 Two beams are used to create shelf levels in pallet racking. Choose from several weight capacities. 1 upright frame, 4 beams & 2 wire decks make up this section of Pallet Rack. 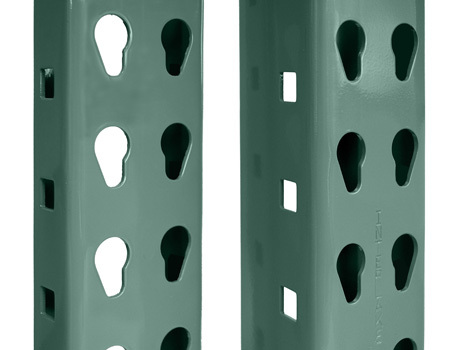 Pallet supports, wall spacers and row spacers all assist in making your pallet rack layout more efficient. These racks are very easy to use. Assembly goes suprisingly fast and the shelves are fully adjustable. I recommend these racks for anyone looking to buy pallet racks. My company had a tight budget and time constraints. SJF was able to deliver on time and within our budget. We will definately be back! I've purchased online in the past from Global and Drillspot.com which I found searching Google. The pricing and selection I found from SJF site blew them both away. My only regret is that I did not shop here to start with. I now am convinced I was ripped off by these sites. I now see the prices they listed as normal prices where not. The so called sale price I though I was getting was much higher what I paid here. I recommend people reading this compare and see what a rip off some sites can be compared to sites like this one.